The parameters of this project were quite broad, that is, looking at “religion” in the available newspaper articles stored in Early American Newspapers Online over the Revolutionary era. As I used to live in Newport, RI and read the Newport Mercury nearly every morning over coffee, as well as the fact that Rhode Island was founded as a colony based on religious freedom… that is where I decided to begin. I was curious to see what sort of religious news was being presented in this tiny tolerant state during the Revolution. Initially I looked at articles in Newport between 1760 and 1789 that included the word “religion.” The first few pieces that I read also included the word “popery.” I found that intriguing and thought that this would be a way of further narrowing my focus. The term popery was used as a derogatory reference to any doctrines, practices, and ceremonies associated with the Pope or the papal system: basically a pejorative word for Roman Catholicism. When searching for the words “religion” and “popery” together I found only twenty-three articles from Newport within the above time range, which caused me to include all of Rhode Island in my search; this produced thirty-three articles. I chose twenty-six non-duplicates: seventeen from Newport and nine from Providence. 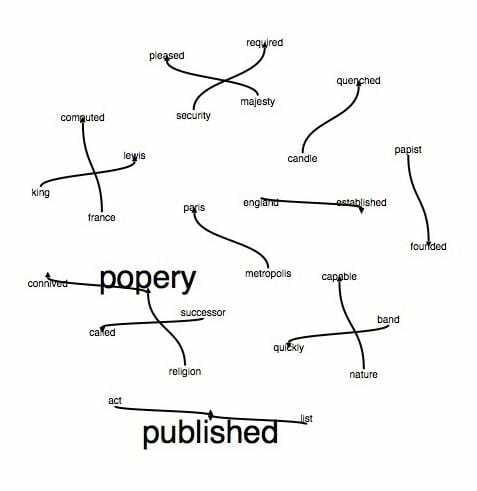 I then was interested in more specific time; I looked at the years of my articles to see where the words “religion” and “popery” may have a higher concentration. There were seven articles in 1775; three each in the years 1766 & 1764; two each in 1774, 1771, 1768, and 1763; and only one in 1786, 1780, 1773, 1765, and 1759. A comparison with the other students’ project data may present a correlation. However, the fact that the largest concentration is in 1775 could certainly be connected with a major event: the Battles of Concord and Lexington. My next motivation was to see if there was any connection in the content. Twenty-four of my articles were reprinted from another publication (most often from Europe). 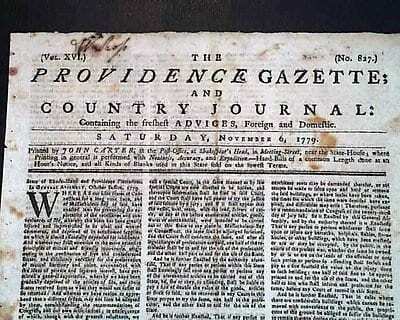 One was “to the printer of the Providence Gazette,” and one was “to the publisher of the Newport Mercury.” In general, the articles were concerned with the tyranny of popery and the fear of the exclusion of liberty in the colonies, and there were three announcements of conversion; however, one letter was from a European citizen asking what exactly the American colonists were fighting over… the Stamp-duty, or Popery? He argued that they had nothing to do with one another and wanted the American colonists to decide on their positon (it was rather funny). One of the articles was the report of fire at Harvard University; included in the damages was the library, which contained “a great many volumes of tracts against Popery.” I found it interesting that those tracts against Popery were important enough to be mentioned among all of the valuable volumes that were destroyed. Wow. Might this suggest that when the religion is popery, then religion is immoral or wrong or harmful?! I think so. 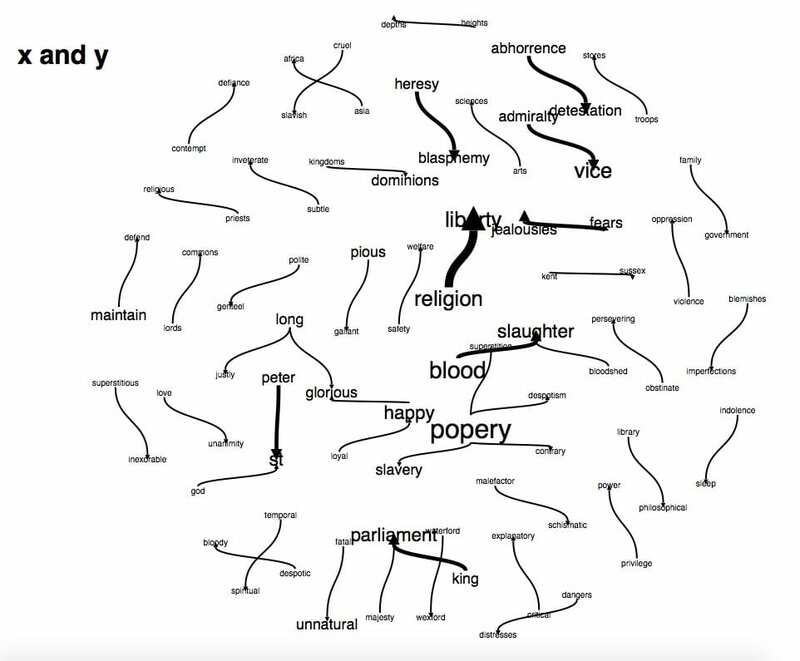 My favorite visual was the word cloud. Probably just because it is colorful and pretty. 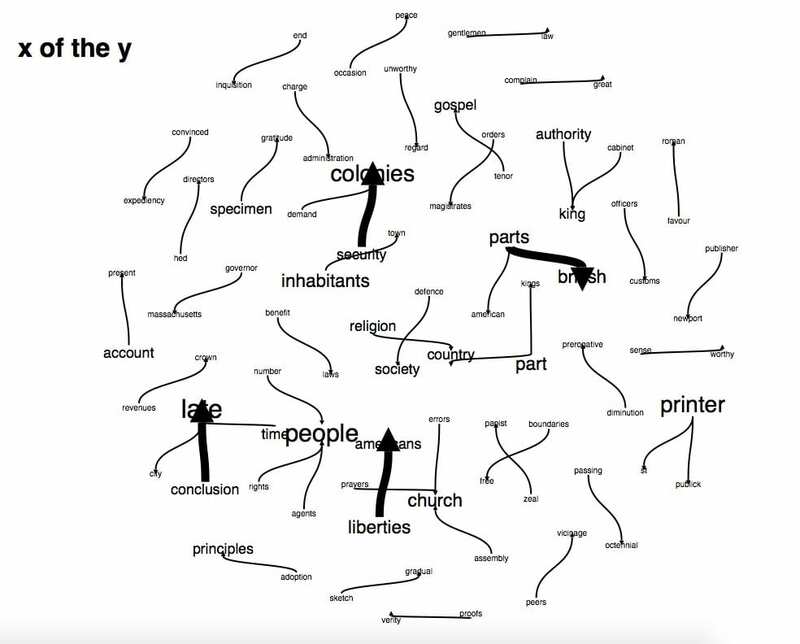 I used both paper machines and voyant to visualize the data, and the word that really stood out to me was “time.” Another student and I spoke about urgency within her project, and it seems that my word clouds had decided to pick up on that theme. “Time” was not a word I used for any of my tags, and I did not note it while reading or transcribing the articles, but obviously it was significant. It was understandable that “popery,” “religion,” “colonies,” “majesty,” and “people” would be large, but “time” was provoking… so I looked into its context. Preforming a word search of my documents, “time” generally referred to a point of existence, such as, “tyranny in the time of,” or “at a time when the enormous increase of Popery…” or “a massacre of Protestants in Paris… in the time of Charles IX.” There were six separate instances of “in Time of Peace,” which needs no explanation… these articles were printed during a time of war. Twice time was used as the infinite measurement of time… and suggests that “time” would be no more with the enslavement of Popery. However, is does not seem that the word time was used as a call of urgency… just a positional reference. However, “in the time of” and “at the same time both for the temporal and spiritual welfare of their American Brethren” are rather ominous and poignant phrases. These were current news articles… happenings “at this time,” and in that case, it was urgent. I was then interested to know the percentage of my articles to the whole available in the Early American Newspapers database. From 1760 to 1789 the database offers 117,654 articles from Rhode Island. My twenty-six are a mere .02% of that total. The number of articles containing the word “religion” are 1320: that is 1% of the total articles. My twenty-six are then 1.9% of the “religion” articles. 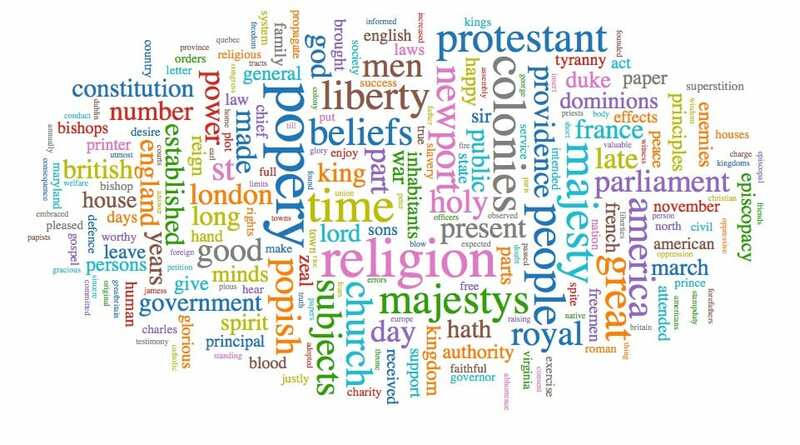 Interestingly, from 1760 to 1789 in Rhode Island, there are 121 articles that include the word “popery” without the word “religion.” Hmmm… what might that say about how people viewed religion and/or popery separately? Obviously, the number of articles that include the words “religion” and “popery” is a very small amount of the total news printed in Rhode Island between 1760 and 1789. I found it interesting that a secondary source noted a large migration of Catholics into Rhode Island later in the nineteenth-century, which really just lends to Rhode Island’s reputation from its beginnings as a religiously free and welcoming state. And quite honestly, with .02% of the total articles in Rhode Island during the Revolutionary era pertaining to “religion” and “popery.” Perhaps these articles were incorporated either because the editors were trying to include a bit of news for every reader, fill space, or include stories that were extremely important elsewhere as Rhode Island newspapers were attempting to produce internationally educated readers by sharing global news. There does not seem to be a large connection between popery and the religiously tolerant state of Rhode Island during the Revolutionary War. R. E. E. Harkness, “Principles Established in Rhode Island,” Church History, 1936.